Hebron is a contested city. The settlements are located in the middle of the city’s center and there are few other places were Palestinians and settlers are living so close to each other. Because of the proximity, tensions frequently arise between the two sides. Hebron, therefore, is often said to represent a microcosm of the Palestinian-Israeli conflict. The city is divided into one Israeli and one Palestinian zone. Normally the Old City is off limits for the settlers, but every Saturday afternoon a group of settlers and supporting tourists go on a “tour” around the Old City. The group is accompanied by some 30-40 soldiers, including a troop of snipers that go ahead to secure the area. In some cases this means entering Palestinian homes. 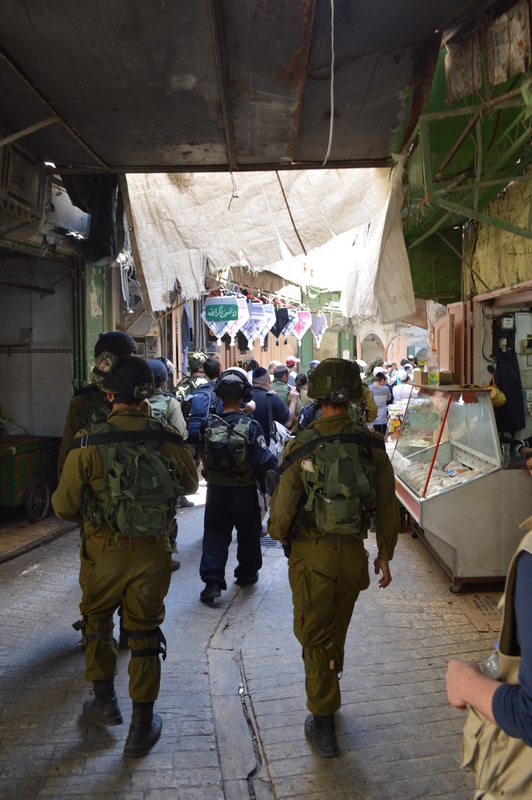 For approximately one hour the group makes its way through the Old City of Hebron protected by heavily armed soldiers. Some of the settlers participating in the tour are also armed. The tour guide is one of the ideological hardliners from the settlement community in Hebron. He presents the settlers’ narrative of the history of the Jewish community in the city. However, from what EAs have observed the audience rarely pays attention to what is being said. Instead they tend to hang out and chat with each other, the soldiers, or they concentrate on their phones. 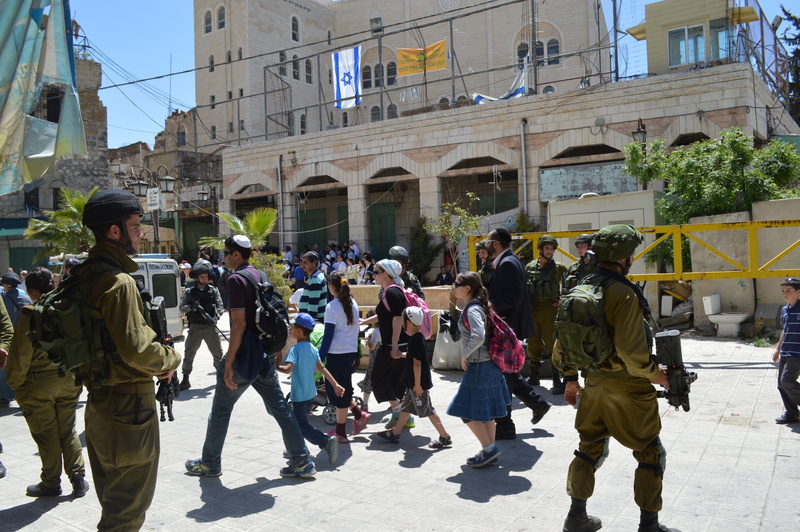 The Settler’s Tour has become a renowned attraction in Hebron. 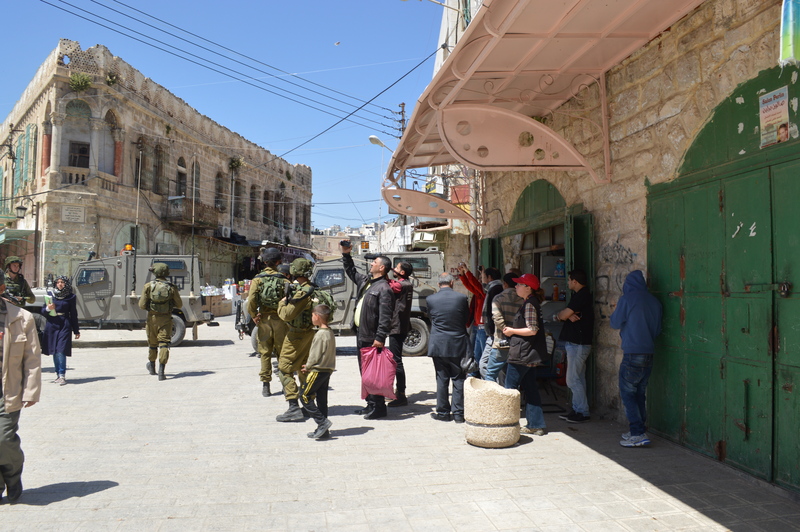 Also regular tourists come to Hebron to watch this spectacle of settlers, soldiers and members of international organisations. The Palestinians living and working in the Old City regards the settlers tour as way of “showing who’s in power” and to “intimidate the population”. EAPPI, is always present during the tours to provide protective presence to the inhabitants of the Old City. We, as Ecumenical Accompaniers (EAs), do our best to ensure that Palestinians do not face restrictions on their freedom of movement and that they are allowed to pass the group of settlers and soldiers without problems. However, the tour is affecting the locals’ ability and willingness to move around the Old City. On one occasion we met two women with their daughters, who said they were too afraid to walk past the tour and decided to wait until it had passed. Nevertheless, the shopkeepers in the Old City staunchly open their shops and refuse to let the “tour” control their opening hours. Today, Simone, an EA in 2013 from Austria shares 4 Reasons why she became an EA. EAs enjoy a break during a long day of harvesting olives. These everyday encounters are what EAs often remember most. Photo EAPPI/M. Schaffluetzel, 2012. The thought of leaving a familiar environment and saying ‘good-bye’ to family and friends for a long time probably does not seem attractive to many people. And if – even to this fact – the journey ends up in a country that is usually only known by less positive headlines from the news, the idea of staying there seems almost lunatic. On the other hand there are people whose faces light up thinking of such a journey, who feel the zest for action and who spare no effort to set out and leave their familiar environment for a certain time. 1. Knowledge is not to be equated with understanding. I studied the history of the Israeli-Palestinian conflict. I read many books and articles and attended many lectures. But it’s hard to understand how everyday life in the Holy Land is like. Living in Palestine, to accompany people on their way to work, and listening to them over a cup of tea brings reality a significant step closer. My conclusion after 3 months as an EA: I do not only know more, but I understand a lot more than before. Yet, I still do not comprehend everything. In Jerusalem or at the Dead Sea it’s almost impossible not to collide with a group of pilgrims. Huge crowds running back and forth behind a guide with an umbrella or any symbol of recognition from the Western Wall to the Church of the Holy Sepulchre to Al Aqsa Mosque. Of course I too visited all these sights and enjoyed the atmosphere of the Souq (Arabic for market) in the old city of Jerusalem. But the very special, unique and unforgettable moments I experienced far off the beaten paths. Drinking tea with Bedouins in the desert, sharing bread and cheese under an olive tree after a hard day picking olives, baking bread with a Palestinian housewife, experiencing the endless hospitality of the Palestinian people and being a small part of their everyday life for a short time. 3. Being part of a change! 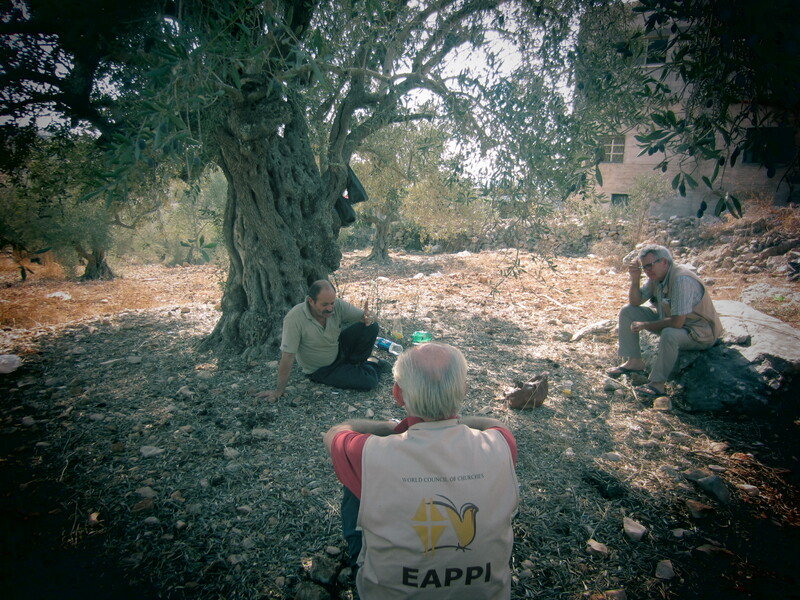 The aim of EAPPI is not to offer an exciting time in Israel and Palestine to foreign volunteers, but to accompany locals on greater mission: to support the Palestinians and Israelis in their effort to end the Israeli military occupation, to document human rights violation, to support nonviolent resistance and provide partner-organizations with reliable data concerning the occupation and its effects for the people. All this efforts target one big thing: To achieve a change in a long-lasting, deadlocked situation and to contribute a sustainable peace between Israelis and Palestinians. 4. Giving people hope who gave up hope! Some changes can happen overnight. Some changes take time. I witnessed how quickly it can happen that buildings are destroyed, olive trees are uprooted and with it the livelihoods of many families may be at risk. I also have seen how long the procedure takes for Palestinians to obtain a work- or building permit and how long cases can take in Israeli courts. Even if I’m not in the position to have a direct influence in the ad hoc situation, I noticed that our presence as EAs gives people hope. We listen to them, we tell their stories at home and bring the situation to the attention of people in our home country. Many people opened their door for us and gave us their confidence in the hope that their stories are heard and ultimately lead to change. These are some of the reasons why I committed myself as an EA in Palestine and Israel. 3 months away from home – separated from family and friends – I found a new home, a new family and new friends. I experienced situations that brought me to my limits and let my personality grow. I had wonderful and unique moments that made my life richer. The memories I have from this three months as an EA give me motivation again and again: Be the change you wish to see in the world! Do you want to know what EAPPI is doing around the world? Read more from Sweden, Australia, the UK & Ireland, and Canada. EAPPI is a world-wide network. Our EAPPI national coordination offices in 26 countries work hard to recruit EAPPI human rights monitors and coordinate their advocacy when they return home. Today, we begin a series in which we get to hear from these dedicated supporters of EAPPI all over the world. Rod, of EAPPI Australia, shares his personal story of involvement with EAPPI. 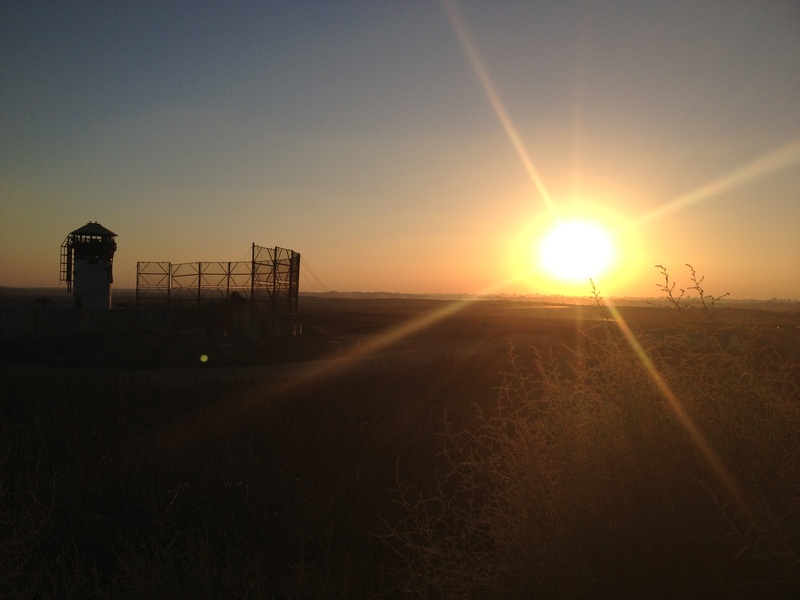 The Sunset over Gaza. September 2013. Photo: Rod Benson. My first visit to Israel-Palestine was in December 2007 with a delegation of Australian Heads of Churches, sponsored by the Jerusalem Heads of Churches. As well as many meetings in Jerusalem, we visited Bethlehem, Hebron, Jenin and Ramallah, and were briefed by various human rights groups including EAPPI accompaniers who led us on a tour of Hebron and the al-Arroub refugee camp. On my return to Australia, there was significant opposition to our public statements from the local Jewish community, and it became clear that I should respond in a measured and peaceful way, not only with words but in actions. At the same time, an investigation group commissioned by the National Council of Churches in Australia was developing a proposal to create a national EAPPI presence in Australia. This was approved in March 2008 and I was invited to join the new committee. Six years later I am still here, better informed, better equipped, and more passionate than ever to seek justice for Palestinian citizens of Israel and an end to the Israeli occupation of the West Bank. What has surprised you most about working with EAPPI? 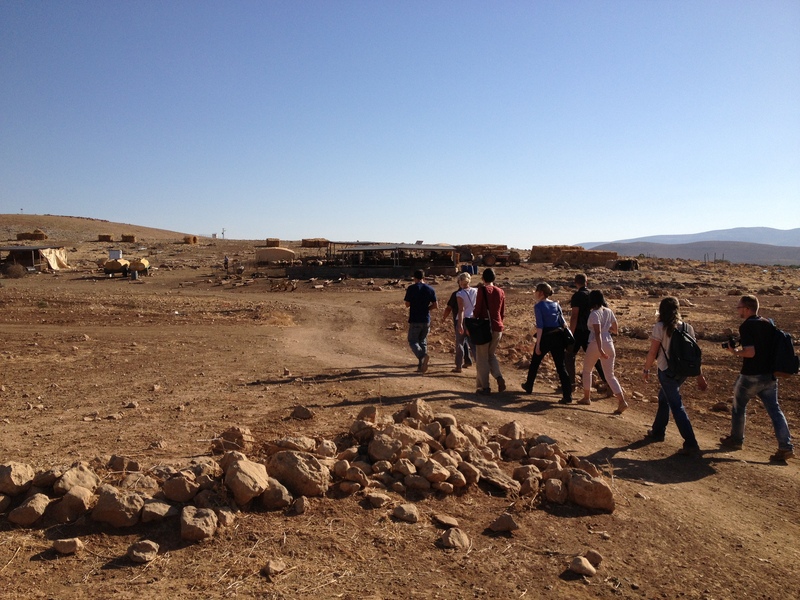 EAPPI representatives from many of the 26 countries visit bedouin villages in the Northern Jordan Valley. September 2013. Photo: Rod Benson. First, it is so inspiring to witness volunteers from remarkably different national, religious and ethnic backgrounds joining together to provide accompaniment for powerless and voiceless people who struggle every day against sometimes overwhelming hardship and injustice. 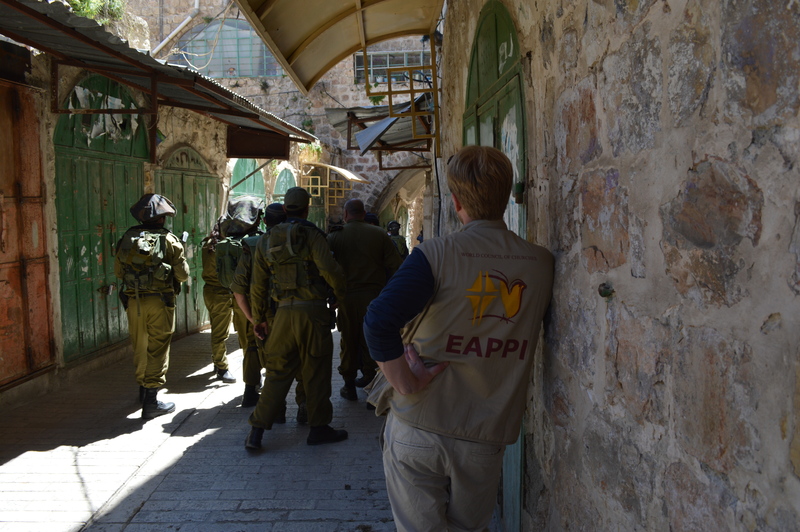 Second, I like the clear focus of EAPPI’s mission to provide protective presence to vulnerable communities, monitor and report human rights abuses and support Palestinians and Israelis working together for peace. We don’t provide financial aid, or material support, or engage in education and training. We just do accompaniment, and no other agency does this. Third, an enormous amount of work is done by the ecumenical accompaniers, and by the dedicated staff based at the Jerusalem office, with quite limited human and financial resources. I am very grateful to those who stretch budgets and work diligently and sacrificially to ensure that the field programs continue to operate, problems are resolved, numbers are crunched, and justice is served. What’s your personal philosophy on what should be done to end the Israeli occupation and achieve peace in Israel and Palestine? Peace will come when there is no more need for the Separation Wall, the segregated roads, the existential fear of violence and reprisal, and other symbolic and actual barriers to freedom and harmony between people. The situation today is complex and in my opinion has deteriorated since my first visit in 2007. We must always insist on non-violent means to end the occupation and achieve peace. Diplomacy, advocacy, economic measures of pressure, education, aid and development, art and sport, accompaniment, modeling alternative communities – all have their place in the pursuit of peace. The future lies with the children, and it is they who must renew hope in the hearts and minds of disillusioned parents and grandparents, and dare to imagine that another world is possible. What do you find the most challenging about the Israeli/Palestinian conflict? It seems clear that both Israelis and Palestinians perversely rely on the ongoing conflict in order to assert and give shape to their personal and political identity. Neither side shows any credible sign of willingness to commit to peaceful coexistence, despite the enormous power imbalance that exists in the region and the terrible human cost of occupation and subjugation. What do you wish other people knew about the Israeli/Palestinian conflict? I was raised in a religious community profoundly committed to Christian Zionism. I wish my Christian friends could see the fallacy of such an approach to theology and geopolitical history, and instead become champions of justice and peace, expressing their faith through service with groups like EAPPI. What would you tell someone who is thinking about joining EAPPI? If you are passionate about justice and adventure, I cannot think of a more rewarding investment of your time and savings than as an ecumenical accompanier. The experience will change you, inspire you, and equip you to be and do what you never imagined possible. The people of Israel and Palestine need you. Go! Rod Benson is an ordained Baptist minister in Sydney who works as Ethicist and Public Theologian at Morling College, and Public Affairs Director for the NSW Council of Churches.